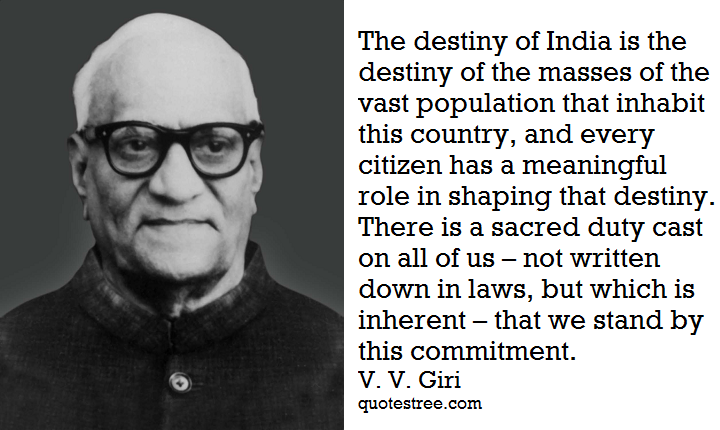 Varahagiri Venkata Giri or simply known as V. V. Giri was the fourth President of India. He also served as first acting President of India before his election as the President of India. It is essential condition to maintain mutual trust and confidence between the employer and the employee to obtain the goal of rapid economic development and social justice. Unemployment is the problem of problems which has made our youths naxalites. Educated youth are deprived of all deserving comforts and their growing discontent has given scope for the sppedy growth of naxalism. Education is the principal tool of socio-economic development and unless all societies are provided with right type of education, adequate in quality and quantity, it will not be possible to tackle satisfactorily the problem of ignorance of health and poverty which afflicts the majority of human beings in the world. It is the power to combine that labour has the most effective safeguard against exploitation and the only lasting security against inhuman conditions. I have not permitted my constitutional niceties in the way of my free functioning in public…given frank expression to views concerning administration so often. A democratic government can gain strength and vitality only by constant scrutiny and the genuine fear that it may be thrown out of a vigilant public opinion. The problems of hunger and food, unemployment, a growing and crushing price rise in the commodities needed for one’s day-to-day subsistence have naturally found angry expressions, sometimes violent expression in many parts of the country. Corruption and falling standard in administration and public life have added to their dimension. The parliamentary system is the most responsive and responsible system of government. Let us not allow it to go into disuse. The youth of the country, who are the most potent force in building India to progress and in preserving its unity, have to be shown the right example and given the right lead. A spirit of self-introspection and dedication to national well-being will make us all go along the right path. 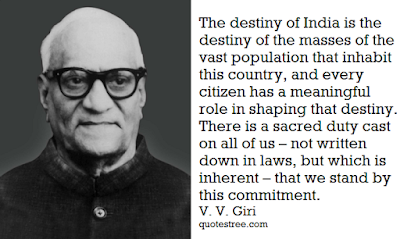 The destiny of India is the destiny of the masses of the vast population that inhabit this country, and every citizen has a meaningful role in shaping that destiny. There is a sacred duty cast on all of us – not written down in laws, but which is inherent – that we stand by this commitment.